Photo courtesy of the artist Chiaki O’Brien is a certified SAORI weaving instructor who will be teaching at the Michigan Fiber Festival this week. You can shop the festival this Friday, Saturday and Sunday at the Allegan County Fairgrounds. 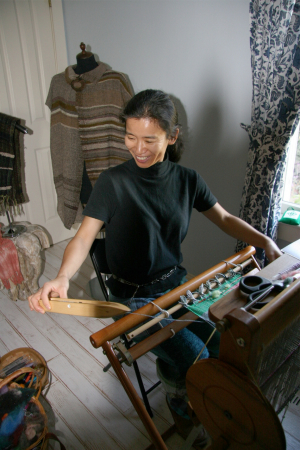 When Chiaki O’Brien rolls into Allegan County and sets up her SAORI weaving looms at the Michigan Fiber Festival this week, her students will learn right away that they are part of one of the happiest growing fiber art movements. I have not studied SAORI in any official capacity, but I ran to my loom after interviewing Chiaki about this con- temporary Japanese hand weaving approach designed for everyone regardless of age, gender, disability or intellectual aptitude. The method, which I covered in this week’s newspaper column for The Grand Rapids Press and MLive.com, instructs people to “weave with a happy heart.” It was created by Misao Jo about 45 years ago when she missed a warp thread while weaving a traditional kimono sash and had her finished product turned away by a Japanese shop owner. And the rest is fiber art history because Jo’s so-called mistake paved the way for a movement to introduce children and adults from all walks of life to create whimsical fabrics using a basic plain weave (over, under) method in which there are no rules, just fun. 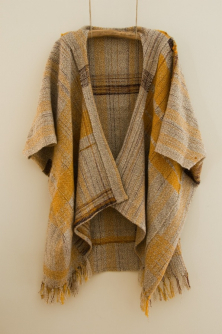 Official SAORI weaving is done on two-harness Japanese looms that are easily adaptable for weavers of all ages and those with special needs, however this weaving method can be done on any loom set up for a basic plain weave. 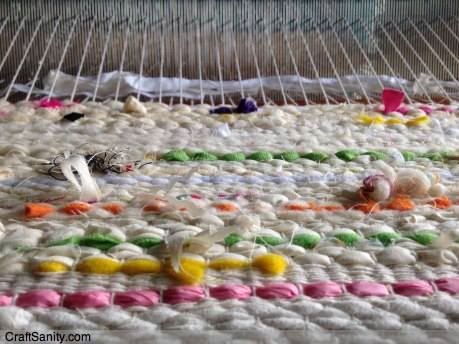 “There’s no right or wrong as long as the weaver is happy,” Chiaki said. While it may seem that this sort of waving would lead to wild and unusable fabric, Chiaki has made lovely wall hangings and garments from her SAORI fabric. As I noted in this week’s newspaper column, I thought it was impossible for me to love weaving any more than I already do, but then I talked to Chiaki and got really inspired. When taking a SAORI approach to weaving there are no mistakes and the weaver is free to create without worrying about how the end product will look. It’s the process more than anything that is celebrated. It’s like yoga on the loom. After recording my chat Chiaki, I hauled my Michigan-made, Kessenich table loom out of the basement and placed in on its stand by the front window. Immediately my 8- and 10-year-old daughters gravitated to it. I got things started by weaving some natural cotton and then sent them out to retrieve a stick from the front porch. A couple rows past the stick I turned the weaving over to Amelia while Abby worked the levers on top of the loom to lift the warp threads for the shuttle to pass through. As the girls worked together, I stuffed random bits and bobs of fiber and paper into the weft. 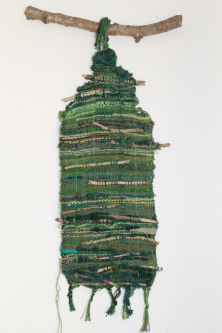 This is the collaborative SAORI weaving I’ve been working on with my daughters. Many of the items woven into this piece are tiny scraps from my sewing table that would otherwise be thrown out. We have also thrown in a stick, a piece of jewelry and bits of paper. It’s fun to see how beautiful all the little bits look when woven together. 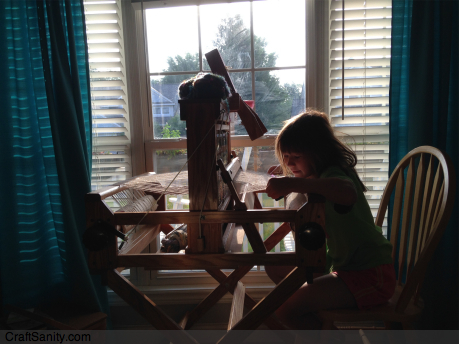 My daughter, Amelia, has been weaving in the mornings while her big sister is away at her summer science class. And this freestyle weaving has continued for several days and it has been wonderful to steal away a few moments, weaving in the glow of the natural morning light that spills into the dining room. You can read my full column about Chiaki O’Brien and listen to our conversation below. And I can’t end this post with out a special thanks to the CraftSanity supports who have kicked in funding to keep CraftSanity up and running. When I decided to start using Patreon last week and asked listeners who are willing and able to kick in a dollar a month to keep the show going, I wasn’t sure what would happen, but right away CraftSanity listeners have started to board my craft adventure bus and fund my dream to make this podcast better. As of this time of this post I have nine supporters contributing $18 total per month. This may seem piddly to some, but I’m quite thrilled and humbled by the kindness of the people who have jumped in right away. Thank you to you all! I really appreciate your support. If you like the CraftSanity podcast and want to contribute, you can create an account at Patreon.com and then visit CraftSanity’s Patreon page and pledge a $1 a month (or more, but we are only asking for $1). Thanks for listening! I’ll be back next week with another show. : ) In the meantime, please send me your podcast guest suggestions and tell me what you’re working on. I’m always looking for fun ideas. Subscribe to podcast via iTunes, use this RSS feed or just search for CraftSanity in many of the popular podcast apps. It’s actually a great and helpful piece of information. I’m glad that you shared this helpful info with us. Please keep us informed like this. Thanks for sharing.